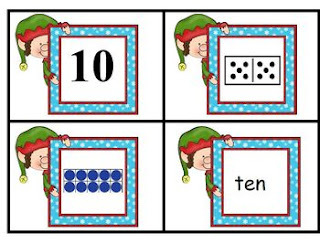 This Freebie contains math game cards for 1 – 10 with a fun elf theme. The numbers are represented on the cards by a numeral, ten frame, a number word, or a domino. 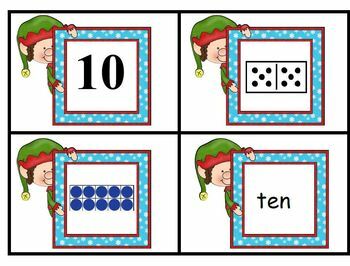 Use these to play a variety of games by having the students match two, three, or all four representations of each number. The cards can also easily be used for a game of memory match or swat. For swat – arrange the cards on a table or the floor. When a teacher calls out a number, one or two students at a time try to swat the correct card with a fly swat. I hope you enjoy this freebie. Please consider following me. I will be posting more reading and math games in the near future. Please rate me. Feedback is very much appreciated. Freebie offered under scrappindoodles license #TPT64341.